“A taste of New York in Los Angeles” my eye. That was the line on Fat Sal’s deli from a local newspaper, a taste of New York in Los Angeles. I’ve lived in New York. I’ve eaten my share of sandwiches there. New York sandwiches are the reason this blog exists. You know what people who make sandwiches in New York know how to do? They know how to make an appetizing sandwich. There are a variety of ways to do this, but here’s one sure-fire come up short: stuff a hero roll with every blasted thing you can think of. 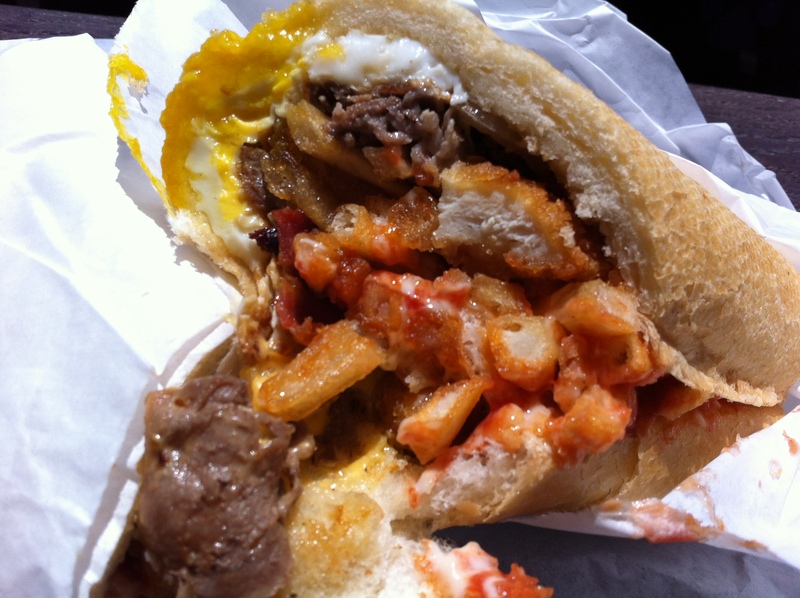 Take the Fat Sal, the namesake sandwich pictured above. 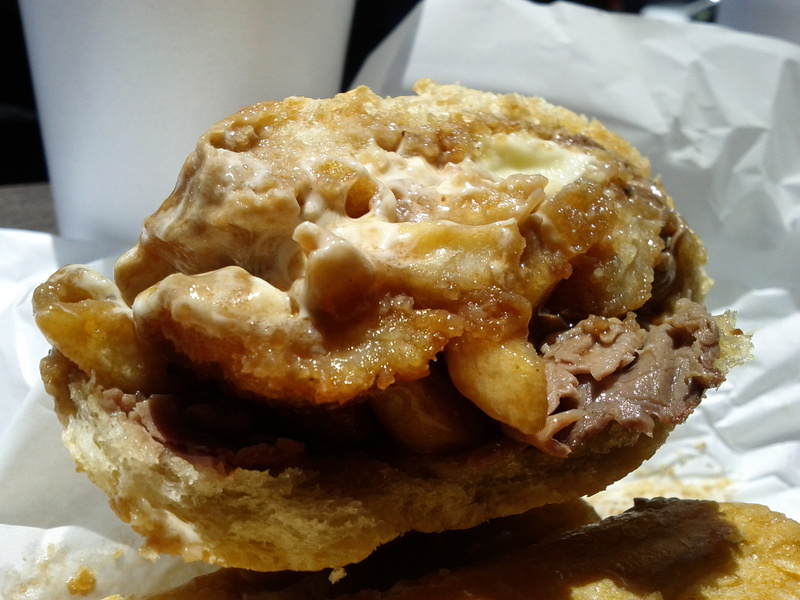 A garlic hero struggles to contain roast beef, mozzarella sticks, onion rings, fries, brown gravy and mayonnaise. In an abysmal case of subtraction by addition, that massive pile of stuff turns into an ugly mash of gravy, breading, and mayo. I can’t think of a single place in New York City that would offer me the above. The Fat Jerry isn’t any better. Cheesesteak, chicken fingers, mozzarella sticks, bacon, fried egg, mayonnaise, ketchup and salt and pepper overwhelm a poor hero roll. Where the Fat Sal tasted of gravy, this one was all breading and egg. In truth, I saw this coming. The mozzarella sticks are the giveaway. I’m sure mozzarella sticks have a fair place on a sandwich, but I’ve never seen them in any context other than an intentionally wacky, get-a-load-of-this sort of sandwich. It’s a flag, flown high and with pride, signalling that restraint has been abandoned, good sense jettisoned. Aren’t we crazy? mozzarella sticks ask, and I can only think to reply yes, yes you are. I get that the things I’m complaining about are the entire point of the endeavor, but a bad idea executed as intended is still a bad idea. I dined here with my esteemed associate Bill, who pointed out that for all the ingredients in essence what you had was a bland gravy sandwich and a bland egg sandwich. For such large sandwiches, he remarked, they were surprisingly small. That might be the most damning thing, that for all their swagger, these sandwiches are nothing more than blowhards. I know New York, Sal. New York was very good to me. You’re no taste of New York. This entry was posted in Sandwich Reviews and tagged Los Angeles, Reviews by Pete, Sandwiches I Have Eaten, Sandwiches Made For Me by Pete. Bookmark the permalink. I love mozzarella and lord knows I’m not one to turn down fried cheese or gravy of any sort, but that looks awful before even hearing that it is bland.